Vessels’ repair needs do not always match with planned maintenance schedules. With specialist underwater teams, no vessel is far from fast, high-quality repair and refurbishment that enable operators to avoid the potential loss of income related to dry-docking. Caption: Wärtsilä offers underwater services, such as repairs, overhaul of propulsion systems, hull cleaning, propeller polishing and welding repairs, on a truly global scale. As the first global operator in the underwater services market, the technology group Wärtsilä is uniquely positioned to offer marine service and maintenance, regardless of the vessel’s location. Maintenance and repair services performed by specialist divers add to Wärtsilä’s comprehensive service offering and allow for operators to minimise or eliminate vessel downtime. “Reduced fuel consumption, efficiency improvements, and higher utilisation rates are always on the top of operators’ agenda. 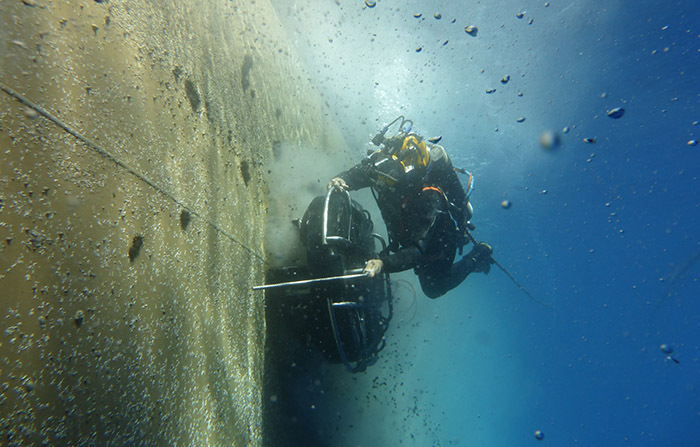 With our in-house specialist teams of certified diver technicians and propulsion experts, we are equipped to offer our customers underwater services on a truly global scale,” says Tamara de Gruyter, Vice President, Area North Europe, Wärtsilä Services. Late last year, Wärtsilä announced its acquisition of Trident B.V., the leading worldwide provider of commercial diving services. With the acquisition, Wärtsilä became the first Original Equipment Manufacturer with a global underwater services footprint. Wärtsilä’s underwater service offering includes underwater repair, overhaul of propulsion systems, and regular maintenance such as hull cleaning and propeller polishing, as well as welding repairs and cofferdam repair. The retrofitting of some components of exhaust gas cleaning system and even complex overhauls can be carried out underwater, changing the nature of vessel repairs and maintenance. Wärtsilä’s specialist underwater teams, based in the Netherlands, Italy, and Canary Islands can be dispatched in a matter of hours, thus enabling fast-response repairs as well as inspections, refurbishment, and equipment installation or replacement for vessels around the globe.